I really wanted to do this challenge, and I really wanted to limit myself to the supplies on the list. I had a vision. A vision of pom-poms. Lots of pom-poms. I went to Hobby Lobby, and found a big, cheap bag of 'em. That's a lotta pom poms. I used quilting thread to make a looooong string o' poms. Here it is at 25' long. 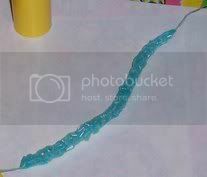 When I got into the project, I squished them tightly together, and the string was more like 8' long. 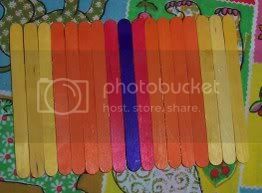 ...glued large popsicle sticks perpendicular to these on the back, and sealed with polyurethane because the colors have a tendency to run. 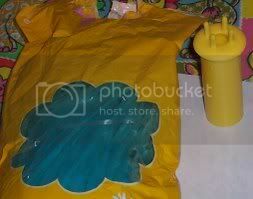 This became the base of the purse. I tied the string of pom poms to the base with quilting thread, and began to wrap. And tie. And wrap. And tie. And tie. And tie. And wrap. I tied thread to thread, and did it tightly so it wouldn't show. 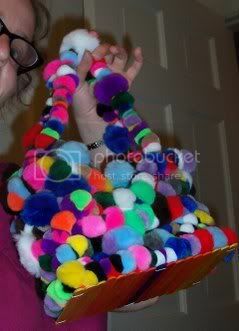 When I got to the top, I tied on two shorter strings of pom poms for handles. Then came the Easter grass! I never thought I'd use Easter grass! I tied strands together and knitted an i-cord with help from the Knitting Knobby. 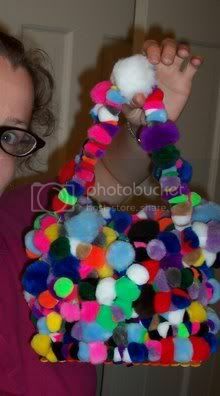 I added light blue pom poms to stick out from the front, and tied the i-cord through the back to make a closure. Fewer than 125 stragglers and factory seconds remain. that is unbelievably cool. it looks like the momeraths in Alice in Wonderland... all huddled together on your purse! Lovely kitschy pom-om heaven! You must be a) done with school or b) trying to forget you have finals! I would never have the patience. What are your plans for the remaining poms? Plans? Um, right now I'm using them to clutter the dining room table. I think I might just let them continue with that job for a while longer. It reminds me of these crazy stuffed animal pants that Flea wore in the Red Hot Chili Pepper's video for "Higher Ground" way back when! "Anxiety is the hand maiden of creativity"
This is a purse that I want to hug. I can picture some lovely Pom pom bows . . . .
That is so cool. One of my favorite things is to take odd items and turn them into fantastic accessories that no one expects. Good job! Wow! That is such an eye-catcher! Maplestory! Windia forever! Hunt me down, I'm MingyDingus! Like personal swaps? Me too. Holy fricking cow. 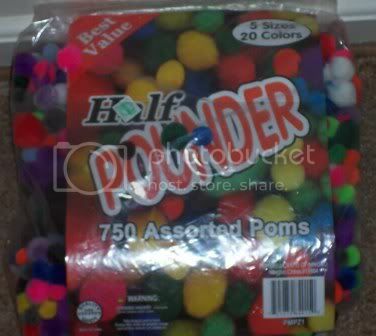 I had no idea pom poms could be put to such uses. That bag screams to be taken out and about. Great job! I love purses from items not meant to make purses, as you know. As you sew, so shall you rip. Don't fear the ripper. quoting myself from about 30 seconds ago "that's coool. i lIke it!" Wow.. genius! I love it! it's crazy and original and simply amazing! Fluffyland - A shop filled with handmade cuteness! Whales, Narwhals, Wrist Wallets, and more! Photos & Tutorials & Haiku! wow! that's so cool! have you used it? i hope you do! 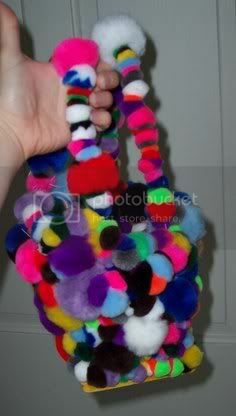 Aww, your pom pom purse is so cute and cudly! I want to hug it!! Took for granted all the little things. All I can say is goodbye. So, don't take this the wrong way, but that is the most hideous creation I have ever laid eyes on. And yet, in some strange way, it's fabulous. Ha ha! 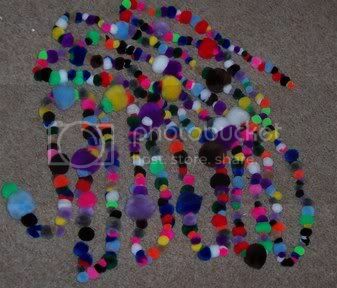 When I was tying the rows of pom poms together, I commented to my friend that it looked like a 1970s rabbit coat on LSD. And that it looked rather like a bunch of poor Muppets gave their lives for my crazy plan.